Mental Maths practice is fun especially when you do your addition and subtraction up and down pyramids! Updated! How do these pyramids work? Add the 2 numbers next to each other in a row and write the answer in the circle above those 2 numbers. Add all neighboring numbers in every row. Fill in the answers until the row above is full. Now add those numbers until you fill all the rows and reach the top of the pyramid. Where the numbers start at the top, subtract the number below it to find the missing ‘neighboring’ number. Some pyramids work from the bottom up – addition , while others work from the top down – subtraction. One pyramid involves several addition or subtraction sums per pyramid = lots of practice! Each sheet has several pyramids = loads of practice. There are 2 pages for each level = plenty of practice. And we all know that Maths practice = mastery. The next level has higher number values or more numbers in each row. Place each sheet in a plastic protector and let your children use a dry wipe pen. ← Pop-Up Books for Free play and Imagination! These are great I always love all your math worksheets. You have some great ideas and I’m so glad you love to share:) I have a question on the 1st few pages your example has 2,1,3 on the bottom so shouldn’t the next row be 3,4 and then the final number be 7? Is it just too early for me or is the example wrong? I don’t get it. IN the first example that you give. how does 3 and 1 give you three? If I follow what the arrows are telling me I should get a total of seven, not six. if you could explain that better I would appreciate it. Nadene, thank you for these fun pages! I did a review of Practical Pages on my blog today, if you’d like to stop by and see. page 6 – levle 4. Where the total is 28…. it includes 14 on the row immediately below…. The package is educative. Keep it up. My 9 year old son loves these pyramids. On his request I’ve build a free adroid App. It is in Dutch but I’ve recently added a English translation. I hope you like the App. 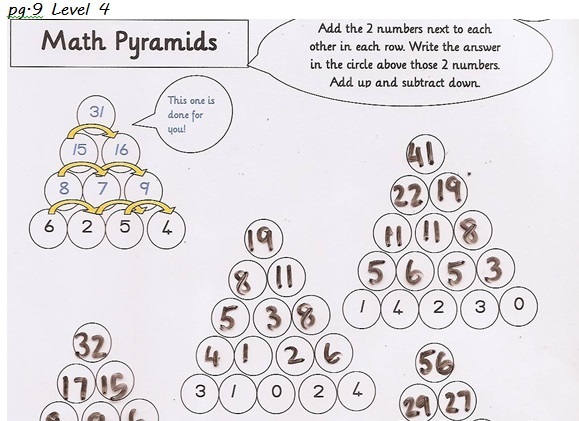 These are nice ideas to practice with number pyramid method. My 8-year nephew use similar worksheets and much more like this. 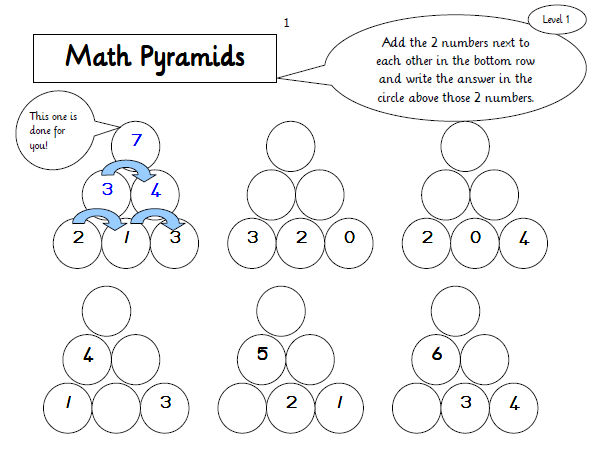 I wanted to share with you this number pyramid worksheet.